It is my great pleasure to welcome you all to Hong Kong on behalf of the Hong Kong Special Administrative Region Government. 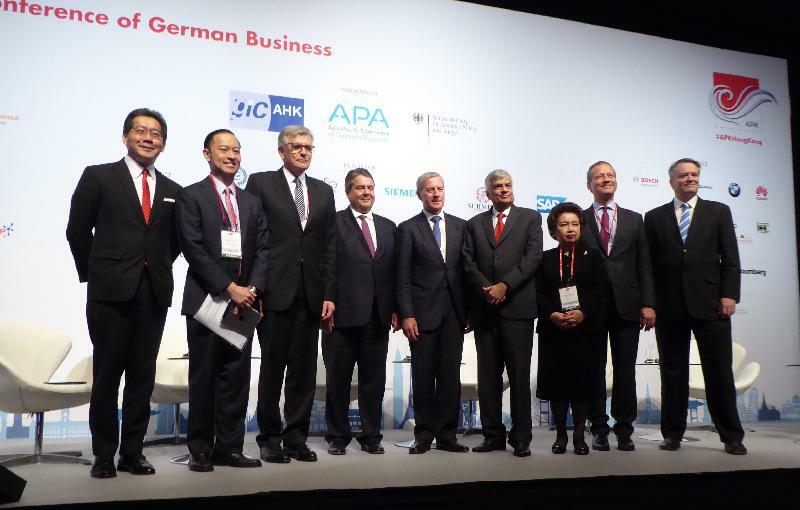 You do not know how excited I was two years ago when I learned that Hong Kong was chosen as the host city of the Asia-Pacific Conference of German Business in 2016. I still recall the fond memories of meeting with many German friends at the last conference in Ho Chi Minh City. And I am delighted to see many familiar faces here today, that you have taken my suggestion two years ago and come to Hong Kong. I can assure you that it is worth the long travel from Germany. As many of you were also in Ho Chi Minh City two years ago, I do not want to repeat what I said at the last conference. I am sure I have already mentioned that Hong Kong has long been ranked the world’s freest economy by the Heritage Foundation. I just wish to update you that we have kept the trophy for two more years, now 22 years in a row. I must have also said that Hong Kong is one of the most competitive economies in the world, and you may be aware that this year we climbed up to the top of the list, and became the most competitive economy in the world in the IMD World Competitiveness Yearbook 2016. Today I want to share with you the hottest acronym in town these days, BAR, which stands for Belt and Road. "Belt" refers to the Silk Road Economic Belt, and "Road" refers to the 21st Century Maritime Silk Road. This grand strategy encourages closer economic as well as cultural co-operation among some 60-plus economies, particularly those emerging economies spanning Asia, Europe and Africa. The Belt and Road covers various aspects and proposes co-operation in many sectors, in particular, in terms of enhancing policy co-ordination, strengthening infrastructural facilities connectivity, facilitating unimpeded trade and investment, deepening financial integration and building people-to-people bonds. But fundamentally, the Belt and Road is about making connections. And I am proud to say that facilitating connections is also what Hong Kong is good at. Just look at this conference today. We have participants from Germany, Mainland China, Sri Lanka, Thailand, and other parts of the world. I am sure that with this two-day conference, especially after the reception hosted by our government tonight, all of us are well connected. German businesses also have great potential to reap the opportunities under the Belt and Road. With Hong Kong's unique advantages under the "one country, two systems", our strong financial services, professional services, logistics and trade sectors, as well as our tremendous experience and expertise in doing business in the region, Hong Kong is the natural and perfect partner for German businesses to expand in the Asia-Pacific region. Indeed, Hong Kong has long-established ties and friendship with Germany. Germany is our largest trading partner in the European Union. You can easily find a lot of German products in Hong Kong. German engineering businesses support massive infrastructure development that is ongoing in our city, one of which is a new "U-bahn", i.e. a new subway line, that Minister Gabriel visited yesterday. On the other side of the harbour, we are also having the 25th Oktoberfest. The conference in the coming two days covers a wide range of important issues. Through sharing of insightful and constructive views among distinguished speakers, I am sure you will come up with innovative ideas to tap the thriving business opportunities in the Asia-Pacific region. I would like to thank the German government and business community for choosing Hong Kong as the host city for the conference this year. 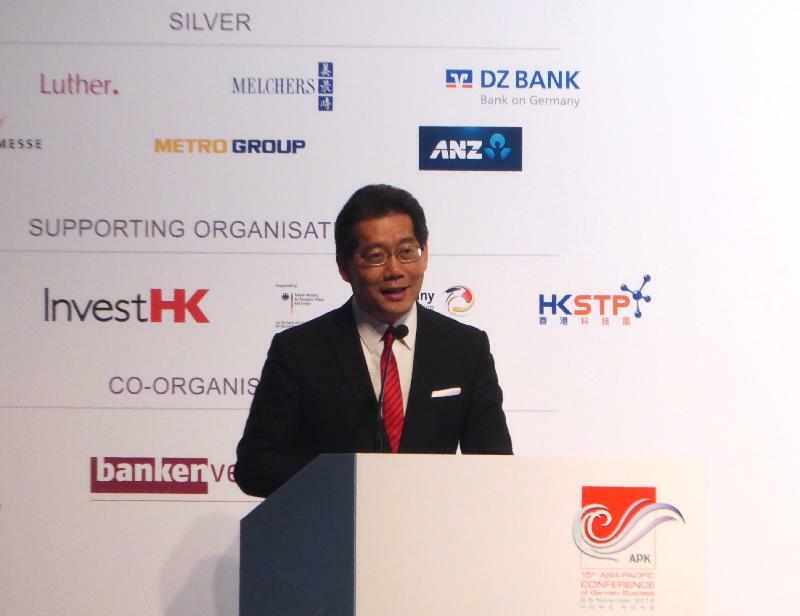 This is a strong testimonial underscoring Hong Kong's advantages as the premier business, investment and logistics hub in the Asia-Pacific region and an ideal bridgehead to the thriving regional market. 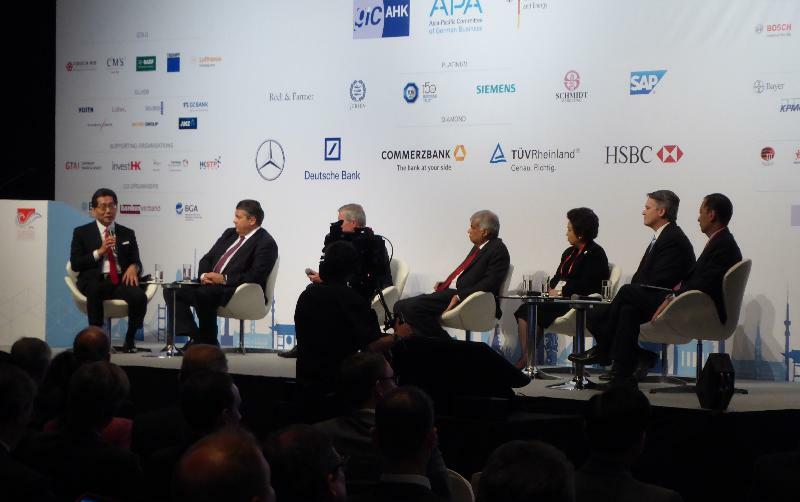 My thanks also go to the German Chamber of Commerce in Hong Kong for the great effort in organising this conference. Once again, welcome you all to Hong Kong and wish the conference a great success.